It's so hard to believe that a year has gone by since a man that was so close to our hearts here at Leeds United, Gary Speed, passed away. Gary played in 312 games, scoring 57 goals before his move to Everton in 1996. He was part of what I consider to be, Leeds United's strongest midfield in modern times; Strachan, McAllister, Batty & Speed. 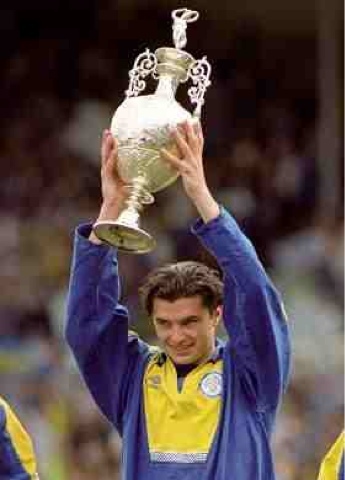 In his Leeds United career, he won a Second Division title medal in 1990 to secure Leeds' return to the top flight of English Football. He was also involved in the side that won the Football League First Division Championship in 1992. The news hit everyone hard, the footballing world united in grief and paid their respects to Gary in their own way accross the country. Leeds United fans have an amazing ability to pull together as one when tragedies strike, and within hours, flowers, shirts, scarves and notes of condolence, amongst other things were placed on the Billy Bremner Statue, outside Elland Road. It really was a sight to behold and brought a tear to even the most hardened Leeds fan's eyes. We had a mid-week match, away at Nottingham Forest two days after we'd heard the news, already plans were in place to pay our respects. We decided to sing Gary's name for 11 minutes, on the 11th minute of play - Which we did. The second we stopped singing, Robert Snodrass scored....This has to be one of the most memorable goals of my life, the look on our faces, some people had tears in their eyes, we were all in disbelif. One of those moments where the hair still stands up on the back of your neck every time you think about it. That Saturday, we had Millwall at home, I don't think I'm alone when I say, I was worried about how they would be. This was the first home match since his death and we were still all greiving, from what I saw though, they were mostly well behaved. A video played on the big screen just prior to kick off, with all of the highlights of Gary's Leeds United career put to music, which was, Stop Crying Your Heart Out - Oasis. It was was such a touching and fitting tribute to him and was met with a massive round of applause, there wasn't a dry eye in the house. No-one had a bad word to say about Gary Speed, he had a lot of friends and I think I speak for everyone today when I say, my thoughts are with his friends and family at this time and we will always remember you, Gary Speed, RIP.